Markus Hofstaetter has photographed a hotrod in a customer’s order – digital and also analog. 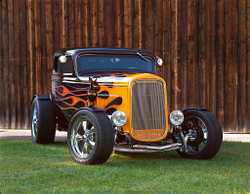 Markus Hofstaetter, award-winning professional photographer from Austria, gets a very special task from a customer: He is supposed to photograph the customer’s hotrod, an old and specially converted American car, in the highest possible resolution for a huge printout. The customer’s dog should sit on the fender. Not an easy task. For this challenge Hofstaetter decides to need a resolution of about 300 megapixels. Therefore, on the one hand he puts together a 24-part panoramic image with his digital camera and on the other hand he shoots an analog image with his large format camera. Both images were presented to the customer for decision. You can find the complete blog entry and further images here at Markus Hofstaetter’s blog. This shows that analog photography is still useful today in the digital age. There are countless slides and film strips, which are still lying on roofs and in slide magazines or shoeboxes and are waiting to get digitized and, if necessary, optimized by retouching. and the usage of analog cameras is increasing. In order to address this trend, Kodak is even reviving the popular Ektachrome film due to many customer requests. Thanks a lot for writing about my work!